You may all remember last year how much I raved about Invisible Ellen (reviewed here) by today's lovely guest, Shari Shattuck. It was one of my 2014 favorites and I still think about it often. So I was thrilled to find out that a SEQUEL was in the works. 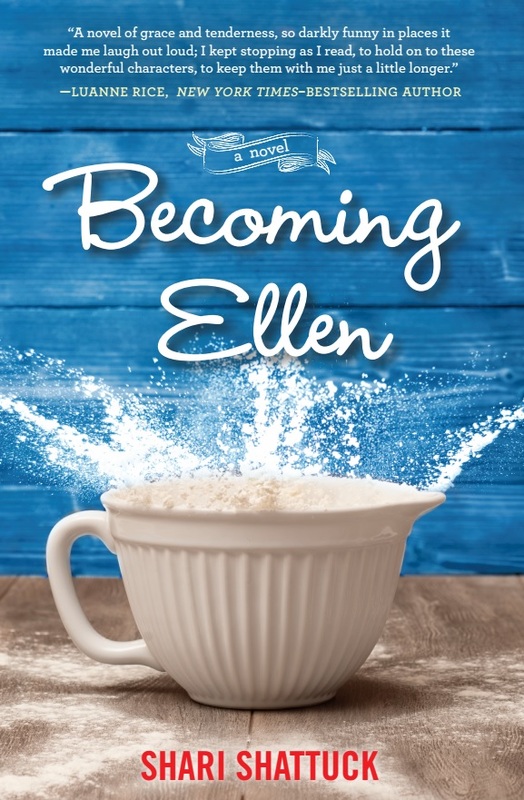 Well, now Becoming Ellen is here and Shari is celebrating her pub day with us! Thanks to Penguin Random House, we have THREE copies for some lucky readers in the US and/or Canada! 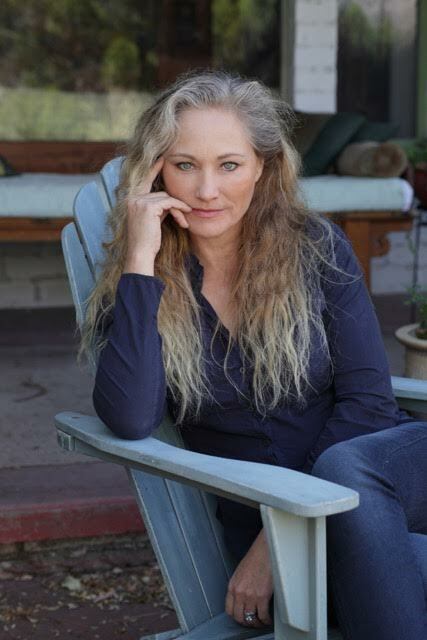 Aside from being an author, Shari Shattuck is also an actress, mom and everyday philosopher, (meaning that she says, "Oh well" quite a bit.) She lives in the forests above Los Angeles with her film director husband, Joseph P. Stachura, and their two magnificent daughters. 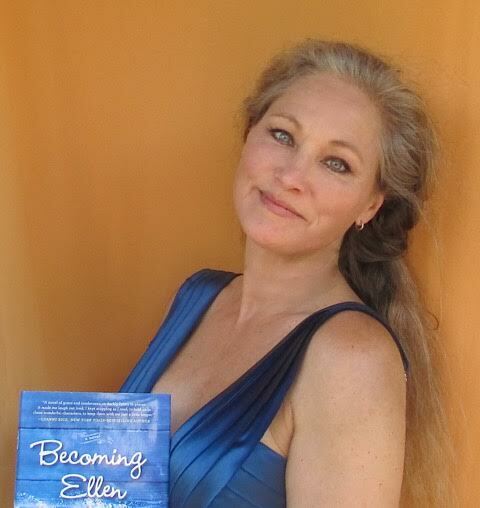 Shari has published seven novels prior to Becoming Ellen. She has appeared in over 200 stage, film and TV productions. Her favorite roles include Sally Bowles in Cabaret, Beatrice in Much Ado About Nothing and Lyles in On Deadly Ground. You can see photos and even clips from some of her work at her website. Visit Shari on Facebook and Twitter, as well. 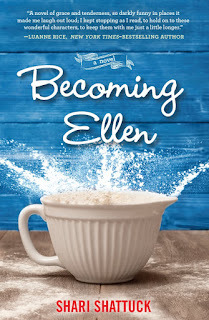 What is something you learned from writing Invisible Ellen that you applied to Becoming Ellen? Each book I write teaches me to see through the eyes of others as well as so much about myself! I think Invisible Ellen was special because the characters are people I relate to in a way that few people who know me would understand. Sometimes we all want to hide from the world or eat our problems away, and others related to that. Overall, what helped me to continue into Becoming Ellen, was the strength that Ellen found in herself, the power that we all have to make the choice to help or to look away. Even someone as damaged as Ellen or as blind as Temerity can make a huge difference with something as simple and easy to give as a smile or a word of encouragement. Did anyone you personally know inspire the characters of Ellen and/or Temerity? Absolutely! I am one of the founding directors of The Desi Geestman Foundation. We work with children with cancer and their families to help them with anything that ‘falls through the cracks’ during such a debilitating and intrusive illness. I have known children with no arms, tumors all over their bald heads, faces covered with the light black hair from hormones, and what I’ve learned from that is that they are the same, charming, sometimes mischievous kids that they always were. There is so much beauty in them, even more so for their trials. As for Temerity, I have a good friend who was the musical director of Cabaret when I played the lead. Now, I’m not a singer, per se, but I figured if a blind musician-director could approve me in auditions, then I could handle it. She is an amazing woman, from whom I learned much about how she ‘knows’ people, recognizes the world around her, and turns her talent to good use. I adore this woman, and admire her so much! What was the easiest part of writing both novels? Most challenging? Mmmmm. The hardest part is keeping the plot flowing with interest and meaning, after coming up with the initial idea, which is always daunting. The easiest thing for me is character work. I’ve worked so much on creating whole characters as an actress for so many years that I have a slew of techniques that just flow through me now. Dialogue is a blast for me to write, after having written for stage, it’s very easy for me to ‘see’ the scene. I hate trying to describe physical places, such as building etc. That’s tough to do clearly without being boring. Since Invisible Ellen takes place in a Costco (for the most part), what is your favorite product to buy at Costco? I don’t really shop at Costco, though I do have several cashmere sweaters that were a terrific buy several years ago. Therein lies the problem—“Cashmere for fifty bucks? I’ll take one in every color!” So, I would go to ‘save money’ and leave several hundred dollars in debt. Plus, now that I have a smaller family with one off at college, and my husband doesn’t run the theatre any more, we don’t have as much need for five gallon jars of mayonnaise. I always wonder where people keep all those huge portions, which I suppose explains why they sell storage sheds. What are you looking forward to most this coming autumn? Cool weather!! Autumn is my favorite season, by far, and I miss that we don’t have much of a fall here in Southern California. Joseph and I always take a short trip to see some fall color. And Thanksgiving is my favorite holiday as well. A day for family and gratitude! What a relief from all the shopping and meaningless material things generated by other holidays. Yes, gratitude is my favorite. Who is your current celebrity girl crush? Wow, I’m not a big celebrity follower or fan type mentality. I suppose it would be a writer. J.K. Rowling is right up there, her book A Casual Vacancy is one of the best written drama/social testaments I’ve ever read. She is amazing. I also love Diane Keaton and Meryl Streep. Obvious, I know. If I was to pick a young actress, it would be Zooey Deschanel. She’s wonderfully funny and I’d love to work with her. My hero right now is a young lady named Danielle who spent two years at City of Hope fighting cancer and is now ‘cured’ and was crowned “Little Miss Lancaster” She’s eight years old and so excited to go back to school in second grade! I have to include her mother in my admiration, because at the same time as Danielle being diagnosed, she took on her sister’s three children when her sister grew ill. So she powered through all that with six kids and a fantastic attitude! I’m so grateful that our foundation was there to help them through this difficult journey. Thanks to Shari for a wonderful interview and to Penguin Random House for sharing her book with our readers. US/Canada only. Giveaway ends August 17th at midnight EST. We love to get wine, hamburger, ziploc bags, TP, paper towels, dog beds, nuts and vanilla from Costco. Stuff we use a LOT of that won't go bad. We are fortunate to have a little room off our laundry room for putting all the ziplocs, TP, etc. in. I can't wait to read the new book! Thanks for the chance to win. I love so many different things there stuff for the household, food, beauty, gift card deals, and love to browse the book aisle! Love to buy great big amounts of coffee and junk foods and browse the books and kitchen supplies! Ice cream! Milk. Bread. Oreos! Toilet paper. I know weird but their own brand is the one we like the most. Also we like the storage containers. UGH, well I haven't read the first one - so now I am going to have to put both books on my wish list! I don't shop at those kinds of places, but if I did... I would definitely buy coffee!!!!!!! regular and k-cups! I don't have a warehouse club membership. I usually stock up on everything at Walmart. I always buy enough to last an extra week in case there comes a week when we don't have enough money to buy groceries. At least we'll be able to eat and the kitties will have cat litter to potty in. Goldfish crackers! My kids eat them by the truck full!! Butter, trash bags, zip locks of all sizes, ground coffee, coffee creamer, toilet paper, paper towels, salmon fillets, and water bottles. I stock up on paper goods, water and coffee. I don't have a Costco membership anymore. I couldn't see paying for the membership fee now that I don't need to buy in bulk. When I was a member, I bought cheese and meat, Amy's burritos and Amy's frozen meals. Oh, I did buy many books without planning to. I like to buy one of the roasted deli chickens for an easy meal after hauling all that big stuff home! I buy paper products, soft drinks, and Prime steaks. Not the fresh stuff because it's way too much to eat up before it goes bad! I would buy coffee and paper goods at costco!! Spotlight and Giveaway: Top Dog!